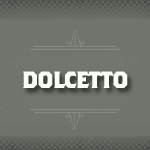 Dolcetto is an Italian wine grape widely grown in the northwest Piedmont region. Black in color, the wines produced from this grape are almost always dry. Considered a light, easy drinking red wine the flavors one may encounter are black cherry, prune and licorice with a bitter almond finish.